Sometimes I'm a little behind the craft trends. Like this time. I finally got my first Washi Tape just a few weeks ago. I've always wanted some, but wasn't quite sure what I would use it for. I've come across quite a few washi-tape-embellished items..... phones, jars, and yes...even shoes...ha! I played it safe and used the pretty tape on mini- thank-you-note-cards to send to my lovely Etsy customers. I'm lovin' the watercolor/washi tape combination. What do you think? What's the strangest thing you've seen washi tape used on? I'd love to know! I'm thinking those are totally stunning! These are so unique and beautiful! I've been making some business cards during that last couple days using wash tape. I love it. Your watercolor work is beautiful. I would love to learn, so I am a new follower by email! 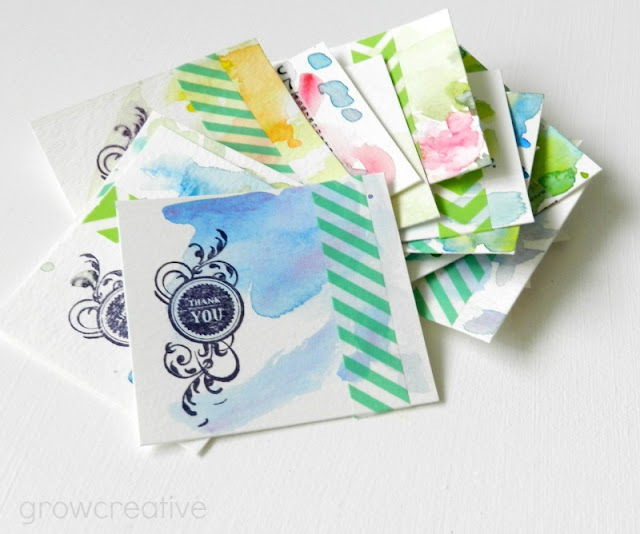 Your note cards are fabulous ! I love your little notecards. I am even more behind than you. I still haven't bought any washi tape. I'm thinking I may buy some for my daughter's Christmas stockings...she's a crafting tween! Have a wonderful Thanksgiving!